Amethsyt has traditionally been worn as a crystal to empower and strengthen. 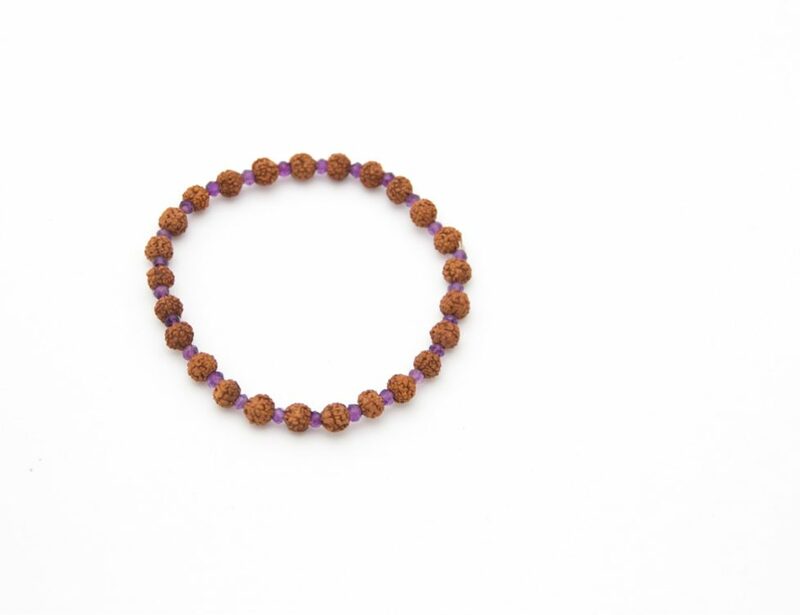 Also in this mala is the holy Rudraksha seed, worn by the believers of the Indian God Shiva and said to help in healing, balancing and aligning the body. This bracelet is strung on stretch elastic. Size is approximately 7-8cm in diameter. The bracelet was hand strung by us in New Delhi, India. Our bracelets are stung on quality elastic thread and fastened under the tassel. Be aware that direct sunlight can fade the tassels of your bracelet.Protect your mala bracelet in the cloth pouch provided to extend the life of your mala. Crystals absorb vibrations and it is a good idea to cleanse your crystals once a month either with smoke from incense or by placing your bracelet under the rays of the full moon outside or on the windowsill.